Now, two Israeli mathematicians, Dorit Ron and Adi Shamir of the Weizzman Institute south of Tel Aviv, write in a new paper (first reported on by John Markoff at Bits) that they’ve found a “very surprising connection” between the individual or individuals behind the first and the individual allegedly behind the second. In October, the FBI arrested San Francisco resident Ross Ulbricht, accusing him of being Dread Pirate Roberts, the hacker handle of the guy who ran Silk Road. They seized his laptop, shuttered Silk Road, and after considerable effort — 25 days — they took control of all 144,336 of Ulbricht’s Bitcoins, which would now be worth more than $115 million, and transferred them into FBI-controlled accounts. Upon doing so, the agency gave anyone a way to trace the history of Ulbricht’s Bitcoin wealth. Although both parties in a Bitcoin transaction are anonymous, the details of all transactions — the address of the buyer and seller, the quantity, and the date — are publicly known, chronicled in a master ledger which can be found here or here (the researchers used the former). So if you can match a given amount with a given personality, it’s possible to excavate the entirety of that person’s Bitcoin banking records. 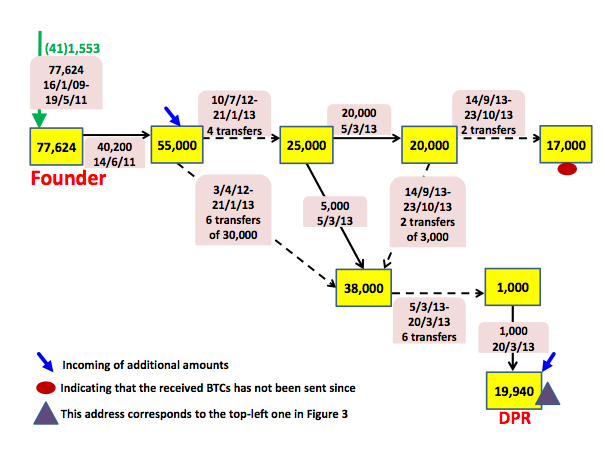 Given the quantities seized, it was immediately obvious which Bitcoins had belonged to Ulbricht, though the FBI publicly released the address of the seized funds account anyway. “Such a single large transfer does not represent the typical behaviour of a buyer who opens an account on Silk Road in order to purchase some narcotics (such buyers are expected to make an initial deposit of tens or hundreds of dollars, and to top the account off whenever they buy additional merchandise). It could represent either large scale activity on Silk Road, or some form of investment or partnership, but this is pure speculation. Bitcoin aficionados themselves like to play down the importance of knowing the identity of Satoshi, heralding him/her/them as more of a benevolent specter who created a universe and whose true identity is immaterial to that world’s success.